Come no closer, stay away! with power in his eyes. 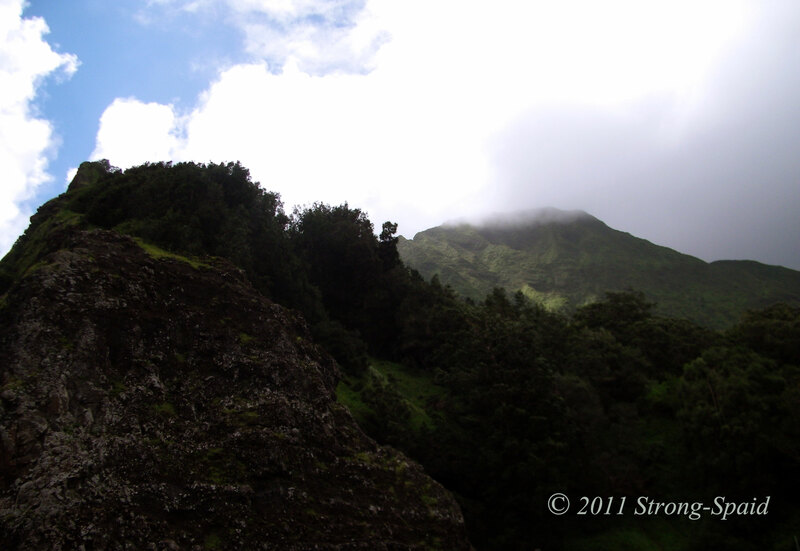 This entry was posted in Poetry and tagged Oahu. Bookmark the permalink. With the Mum’s attitude I think they will not have a problem surviving! 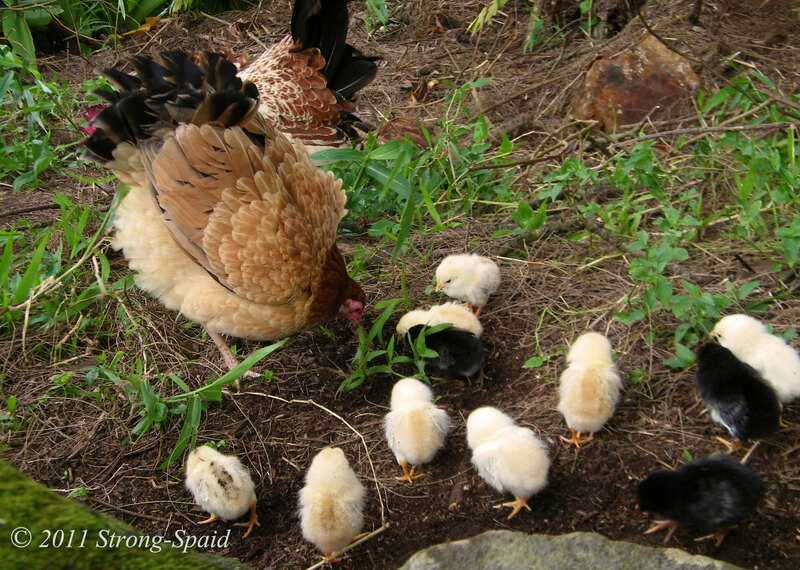 These wild chickens are very independent and pretty tough. They know how to take care of themselves. I just added a photo of the “dad” rooster. If mom’s stern look didn’t keep me from coming any closer, dad would have stepped in….no question about that! I spent one summer doing grad work at U of H Manoa. I remember being amused by the chickens running around campus. Here on Vancouver Island our universities are over-run with rabbits! Maybe the rabbits are a little quieter than chickens? What lovely photographs! They are very artistic. And a very interesting post, of course. Beautiful poem, lovely photos and a great little story. 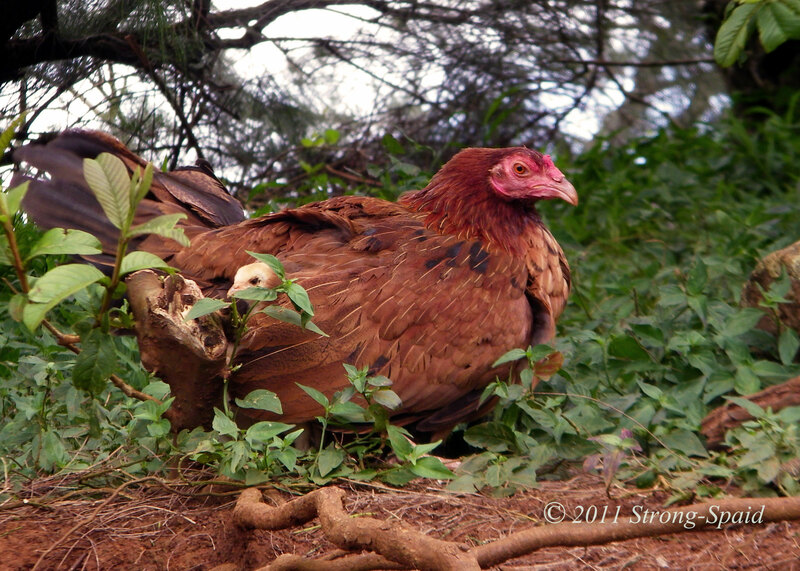 I saw wild chickens on Kauai and found them the most beautiful birds. I know everyone loves parrots and huge birds of prey, but watching those chickens, especially the roosters, strutting around with their shiny, colourful feathers really took my breath away. Well worth a poem! They are proud and independent, that’s for sure! And rumor has it that if you try to cook one of these wild chickens and a rock at the same time….the rock will get tender, soft, and done before the chicken. So, sometimes being tough will save your life! I love the rumour – long may it spread! No….that would be the “Crazy Shirt” company. I should have bought one! I see what you mean, Dad looks really on the case. They are magnificent but I can see how their attitude could make domestication difficult if not impossible. My Cochin are the opposite and my hand reared hen Chi demands daily hugs before she will eat breakfast. Daily hugs. That’s so cute. Even with all the chickens roaming on the islands, I had never seen anything like that black and orange rooster before. Quite an intimidatingly handsome one, I thought. Your photos and poetry are beautiful. That is one gorgeous rooster! I agree. 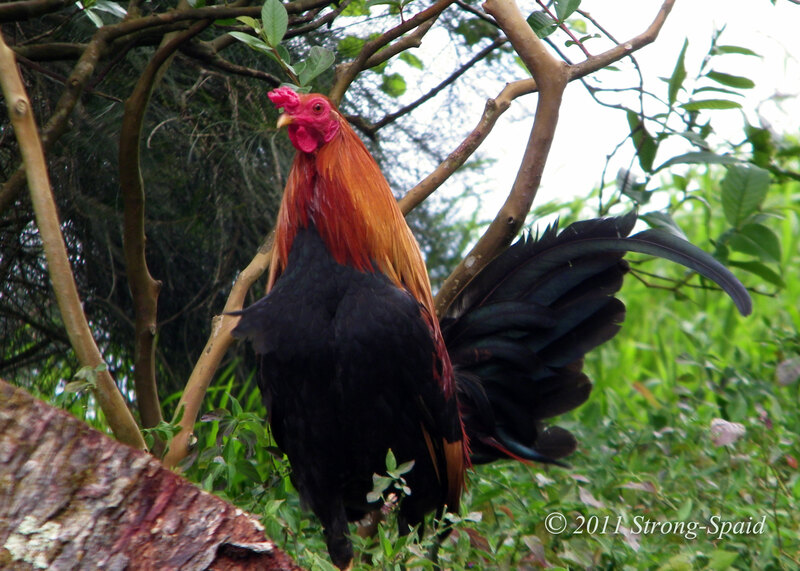 With those black and orange feathers, combined with that look on his face….he is one gorgeous rooster. standing tall and strong. I don’t think he’s afraid of anyone or anything. I certainly wouldn’t want to get in an argument with him! Great blog! I thought you might have been from around here when I saw the Banyan tree in your photo. I have often seen the wild chickens on the Old Pali. Nice to stumble across your post. Sigh. I was from around there. I lived on Oahu for 11 years (military/Navy). I am still there in my mind. If people ask me where I am from, I will say Hawaii. There is no place in this whole world that made me feel so at home. Had a little sailboat for awhile and sailed all around the islands. Quite an adventure. I also sang with the Hawaii Opera Theatre (HOT) while I was there–a great group of people. Now I am living in Virginia, where it is freezing cold today. Auuuugh. We are coming back to visit Hawaii again in the Spring. Hawaii is always here for you, I’m sure it will be a great homecoming. Amazing blog! Thank you for likes on my blog.